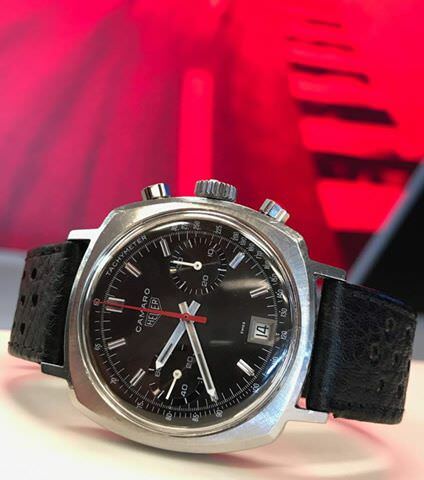 late 1971 (S/N 232xxx) Heuer Camaro 73443NT with a very rare black tachymeter dial. In excellent working condition--keeps great time and chrono functions work smoothly, winds very easily. Had a complete service in April 2017. Case has some light scratches but still has very sharp edges and lugs. There are some imperfections in the dial BUT dial print is very crisp and legible and the slight imperfections are very difficult to see except in bright sunlight. Comes with custom leather rally strap and Heuer buckle. Please email for more pictures!